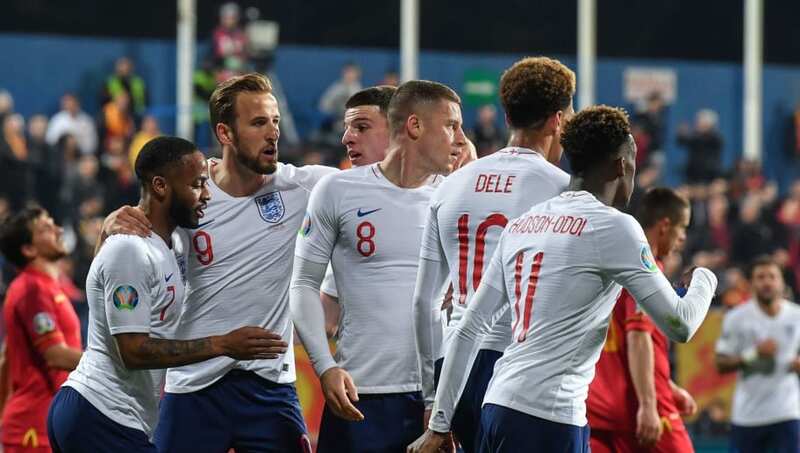 England came through a tough test in Montenegro to make it two wins from two from their opening Euro 2020 qualifying games. The game provided a learning curve for this young England side, coming from a goal down, and will stand them in good stead for sterner tests in the future. An opening goal from Marko Vesovic shocked the nervy visitors into action, but two quickfire goals from Michael Keane and Ross Barkley put the Three Lions in control – control which they refused to relinquish. Further goals from Barkley, captain Harry Kane and Raheem Sterling made the scoreline much more convincing disguising the fact that the game began in a less than comfortable fashion for the Three Lions. Marko Vesovic's opening goal midway through the first half was the perfect example of tenacity. The Montenegrin received the ball on the left-hand side, about 10 yards from the England penalty area, before surging towards the backtracking Michael Keane and the Three Lions goal. Keane must have felt that he had got a crucial tackle in on Vesovic, but the ball rebounded back to the Montenegrin who continued his run before bending it into the net, just out of the reach of the diving Jordan Pickford. Goalscorer Marko Vesovic was Montenegro's most threatening player, causing the England defence numerous problems with his direct running and ability to draw a foul. He was rewarded for his industriousness with a well-taken goal, and in the absence of Stefan Jovetic, offered the clearest attacking threat for the home side. If Montenegro want to qualify for next year's competition then performances like this from their attacking players will be key to those chances. England were shaky before conceding the opener, with Kyle Walker unhappy with the defensive work being done by youngster Callum Hudson-Odoi. Following the goal, Hudson-Odoi and Raheem Sterling swapped flanks and...well, that seemed to do the job. The switch gave England a better shape and also allowed Hudson-Odoi to cut onto his favoured right foot. It also unsettled the Montenegrin defence who, up until that point, were dealing with England's attack well, limiting the visitors to only a few chances. The switch in flanks also led to England's second goal, with Hudson-Odoi cutting in and shooting, with Chelsea teammate Ross Barkley anticipating the shot and diverting it past Danijel Petkovic in the Montenegro goal. Chelsea man Ross Barkley was England's brightest attacking spark in the Podgorica City Stadium on Monday night. Following a positive performance against the Czech Republic, Barkley provided much of the creativity which England needed to break down a stubborn Montenegrin defence. He provided the cross for Michael Keane's goal, as well as being opportunistic enough to poke home Hudson-Odoi's shot. He was also well placed to stroke home Sterling's cutback for England's third which opened some daylight between the two sides and made the game more comfortable for the Three Lions. Montenegro's welcome Kosovo in their next European Championship qualifying match in June. Montenegro will fancy themselves in this match and will see it as an opportunity to manoeuvre themselves into second place in the group. England face the Netherlands in their next match, in the Nations League semi-final. Gareth Southgate will be hoping to keep his key players fit for the game in Portugal this summer as he eyes a first major trophy for the Three Lions since the World Cup in 1966.